At work we had need for a multiple temperature logging device. Using one of my cheap Chinese Arduino Uno clones, some DS18B20 one wire Waterproof Temperature Transducers (like these ones), a cheap Ethernet / SD card shield (like this), and a DS1307 RTC (Real Time clock) (link). 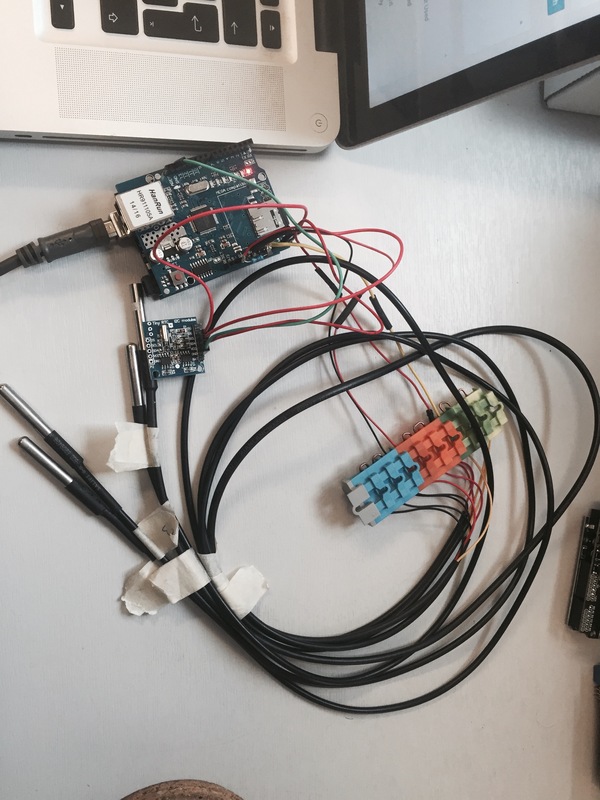 The DS1307 RTC is connected using SDA and SCL to A4 and A5 on the Arduino, and the DS18B20 Temperature sensors are all connected to A0. 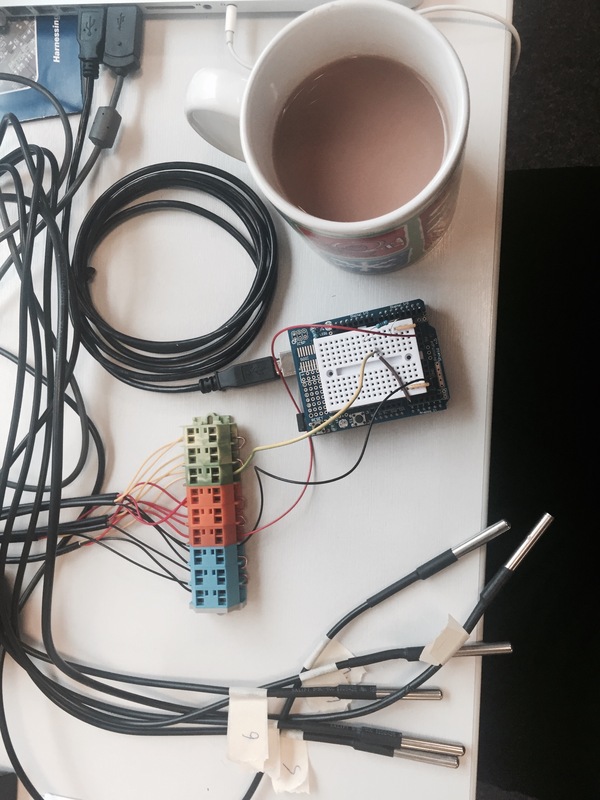 Arduino Temperature Thing with Ethernet Shield and SD card. The Wago 261 connectors are just something we had laying around at work, and to be fair they are quite an awesome way of making semi permanent connections that are easy to take apart. The S18B20 Temperature sensors have a pull up 4k7 resistor between the Data cables (Yellow) and the 5V line. 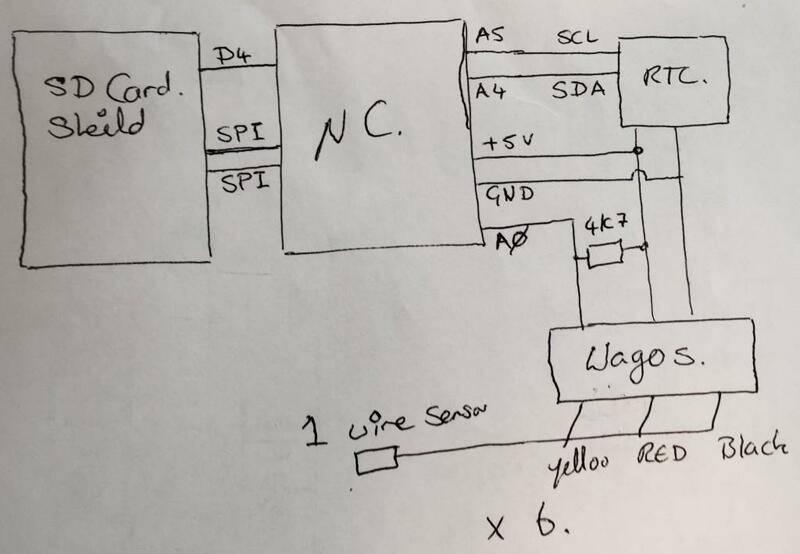 If you have the code set up for more Temperature sensors than you have attached, the last sensors value will just be repeated. There is no way to know which sensor will be which before you power them all up, hence the little flags of paper on each sensors lead (and the calibration cup of tea). const int chipSelect = 4;                // On the Ethernet Shield, CS is pin 4. Note that even if it's not used as the CS pin, the hardware CS pin (10 on most Arduino boards, 53 on the Mega) must be left as an output or the SD library functions will not work. DallasTemperature sensors(&oneWire);    // Pass our oneWire reference to Dallas Temperature. pinMode(LED, OUTPUT);                    // initialize the LED pin as an output. pinMode(chipSelect, OUTPUT);            // make sure that the default chip select pin is set to output, even if you don't use it. // open the file. NB only one file can be open at a time, so you have to close this one before opening another. Hi, useful programme, but seems to get hung up on Wire.h (see below). The problem is that Wire.h doesn’t seem to be available from the web or the Arduino library. Any suggestions (I am a programming novice)? Wire is included with Arduino, try downloading and re-installing the Arduino IDE. I’m irinakim and I’m work in the Wiznet. We are collecting so much data using ourproduct. Can I post your product on our Web site?